Most women will step away from the wine after they see that positive pregnancy test. But what about those who are trying to get pregnant? Most women know that drinking during pregnancy is a no-no. They also know that the early part of pregnancy is the most vulnerable—and since women also tend to be aware that a pregnancy test won't register as positive right after conception, one might imagine that women who are trying to get pregnant would abstain from alcohol while they're trying to conceive. But in many cases, this isn't accurate: According to a recent study, a surprisingly large portion of women who hope to get pregnant are still indulging in alcohol. The study focused on 5,000 women who were surveyed twice during the early part of their pregnancies. While only about half of all pregnancies in the U.S. are planned, 70 percent of these women got pregnant intentionally—yet over half of the women sampled also admitted to drinking in the months leading up to their pregnancies. Many of the women sampled reported that they stopped drinking at around four weeks pregnant, which is, not surprisingly, the time when a pregnancy test would register as positive. "Our data suggest that the majority of women, regardless of pregnancy intention, stop or decrease alcohol use around the time of a positive pregnancy test," the study's authors wrote in the journal Obstetrics and Gynecology. A specific demographic was most likely to drink while trying to get pregnant—and during their first trimester: White, college-educated, relatively older women with higher incomes. Researchers suggest this might be because doctors aren't as inclined to police the lifestyle behaviors of members of this group. But while we know that total abstinence is the way to go when it comes to pregnancy, we also wonder: How much damage can a woman do if she unintentionally drinks during those first few weeks of pregnancy? "I do think women who are trying to conceive...may not be as serious about their social lifestyle, and alcohol is one of those things they may not be restricting as much as they could be or should be," Sherry Ross, MD, an OB/GYN and author of She-ology: The Definitive Guide to Women’s Intimate Health. Period, told Fit Pregnancy. "I don't recommend total abstinence when you're trying to conceive, but I do stress responsible drinking and drinking in moderation. Having one drink a day or two drinks on a Friday or Saturday night if you're not drinking during the week is acceptable for the most part [while you're trying to conceive]. I would say if you're really trying, I would discourage any drinking after ovulation in a perfect world." Dr. Ross told us that she does see a lot of women who continue to drink while trying to conceive, but she warned us that women who drink in excess can affect their chances of getting pregnant. According to the expert, women don't usually need to worry if they've had a drink or two after conception—but, as always, it's better to be safe than sorry. 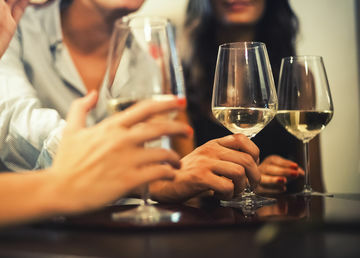 While avoiding alcohol when there's a possibility of pregnancy is the gold standard, drinking in moderation may be safer than binge drinking. But could issues creep up later in life among the children of women who unknowingly drank during those first weeks of pregnancy? We spoke to Danielle Fisher, MD, FAAP, chair of pediatrics at Providence Saint John’s Health Center, to learn more. "Fetal alcohol syndrome is something that will occur with exposure to alcohol, but it actually has to be a fairly decent amount of alcohol," Dr. Fisher said. "It's usually not from just one drink. Everybody has different assumptions when they are pregnant about what is safe to consume and when it is safe to do this. As the article was talking about, sometimes [drinking happens] early on in the pregnancy, and that can be the most dangerous time for organ development. I think there could be a little bit more awareness that when women are at childbearing age and ability, they may want to watch their alcohol consumption if they are actively trying to conceive...We are concerned if moms are going to consume more than two alcoholic beverages in a sitting." According to Dr. Fisher, fetal alcohol syndrome generally becomes a major threat between the sixth and tenth week of pregnancy. The good news? Moms tend to know they're expecting at this point. But while these opinions are reassuring for mamas who drank moderately before they found out they were pregnant, we should also remind you that when it comes to alcohol, total avoidance is your best bet during pregnancy. If you're actively trying to conceive, staying away from the booze (especially in those weeks between ovulation and a positive pregnancy test), even before you've gotten that postive pregnancy test, might be the best way to go.